Disclosure: These items were sent to me free of charge for review purposes. All opinions are my own. This July, the United Kingdom-based brand, Playful Promises, launched their new Curve line. Founded in 2004, Playful Promises is directional design mixed with playful details. From stockings and harness bras to tassels and teddies, they carry a little bit of all things lingerie, but up until recently, their size range extended only to a US 12. The introduction of the Curve collection extends that range to a US 20. They debuted this new collection with a shoot featuring UK lingerie blogger, Fuller Figure Fuller Bust. The Curve line contains a mix of pieces available only in the curve sizes as well as some that are also available in core sizing. The 19-piece selection includes harness bras, paneled suspender belts, mesh body suits, and embroidered lingerie. There’s a level detail put into each piece that makes each standout, but a thoughtfulness that makes them cohesive as a collection at the same time. I see confidence mixed with coyness. When I learned that Playful Promises was introducing plus sizes, my interest was certainly piqued. Before they debuted a Curve line, I was attracted to the way that their pieces mix fishnet with floral and play with cut-outs and caging. It was nearly impossible to pick out which pieces I wanted to try because not only did I love all of them, but also these styles are so different from what’s usually available in my size. It was clear to me that they weren’t sacrificing or adjusting their aesthetic to make plus size pieces; rather, these pieces fit alongside the brand’s other offerings while still providing the additional support needed for plus sizes. After much deliberation, I picked the Candace Electric Blue Strappy Curve Bra paired with the Candace Electric Blue Strappy Curve Brief and the Jessica Curve Black and Gold Beaded Sleeveless Bodysuit. I’ve never worn a bodysuit but I have tried out a few caged or strappy pieces both in the form of briefs, bras and bralettes. Though I certainly like the way these elastic straps look as a detail, they never seem to add any level of support. I can say that the straps on both the Candace bra and brief served a very supportive purpose. As soon as I took the bra out of the package, I noticed how substantial the elastic felt. The elastic band around the bottom is 1 inch thick and the elastic straps are a half inch, which is a good quarter of an inch larger than what I am used to from other plus size elastic caged pieces. When I put the bra on, I felt an extra lift when I pulled up the second set of elastic straps. On other caged styles I’ve tried in the past, I’ve experienced this extra strapping done just for looks, but this provided additional support. The front of the bra impressed me, but the back of the bra straight up wowed me! It features two pieces of five-inch wide boning that lead into a wide-back mesh panel. I sometimes get spillage over my back band, but I liked that I didn’t have to worry about that in this bra. It was a hybrid between a standard bra cut and a longline style that worked perfectly for my body. I am wearing the 42D which is the size I currently wear. I wore the strap around my neck -- both under and over the bra. It worked both ways but I preferred the way it looked under the bra. You can also adjust the strap and wear it around your waist. For the brief, the rise hit me right above the belly button and I was able to tighten the elastic strap to make them sit a little higher. The front of the briefs features a sheen and the back is totally sheer. I usually wear a US size 20 on the bottom and I had never worn any lingerie in UK sizing before so I knew there was a possibility that this could fit differently. I ended up getting the briefs in a US 16 (UK 20) and the fit was perfect. That either means that they have a great amount of stretch or that the Curve styles run a bit big. Either way, it’s good news for anyone size 22+ who is sized out of their current selection, especially when compared to their straight size offerings which TLA has found to fit true to size. I also tried out the sleeveless beaded bodysuit in the US 16 (UK 20) and had a similar conclusion about the fit. 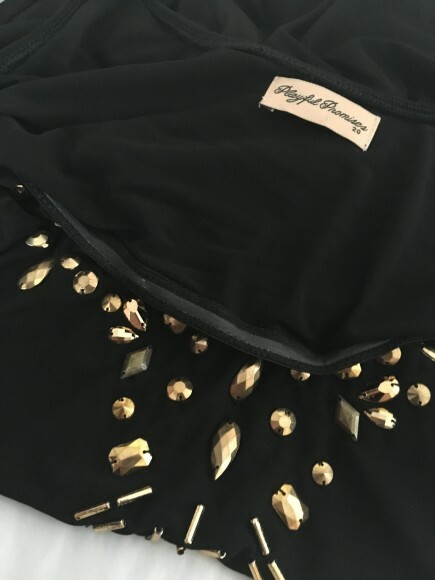 I originally shied away from trying the Kylie Sleeved Bodysuit because I wasn’t sure the 20 would fit my arms but my experience with the fabric of the Jessica Bodysuit indicated that this fabric had a lot of stretch. I took special caution putting it on because the fabric is very delicate. The bottom half is completely sheer and the bust is double lined. The inside of the second layer of fabric features a thin silicone panel to keep it in place which I appreciated. The high-cut neckline and double layered fabric in the bust made this feel like more of a piece I would wear out with a skater skirt than in the bedroom, but I love lingerie that can double as outerwear so that worked for a person like me. Much like the fabric itself, the beading was very delicate. The piece is beaded around the neckline and down the sides. The gold beads are attached on the inside with black thread which is hidden in the areas where the fabric is layered but otherwise exposed. There's no beading in the back and given the intricacy of the pattern and the nature of the fabric, I think this was a wise design choice. The bodysuit came with a small package of extra beads which came in handy because I did lose a bead while putting it on. As a designer myself, I have no problem hand-sewing the beads back on, but I could see this being a frustration for someone else who may not be as comfortable with sewing. Overall, my experience with the new Playful Promises Curve line was very positive. I experienced a strong attention to detail for plus size bodies without any sacrificing of the brand’s signature style. Although I would love to see this line extended beyond a US 20, I am encouraged that at least in the pieces I tried, they ran big. I will be waiting to see what else they come out with in plus sizes, and that’s a promise! Have you tried out the Playful Promises Curve line yet? What other styles from the Curve line would you like to see on? Great designs and a wonderful review. I am excited by the offerings for the curvy marketplace. The quality looks very nice too. The model also looked great in the pieces. You look so lovely in these pieces! I adore the whole collection. Thank you so much for such a lovely review, Alysse! You look amazing in these pieces! I was pretty excited when the Curve styles became available for pre-order! Some of Playful Promises’ knickers have worked well for me in the XL, but I was excited to have more to choose from. These pieces look great on you, thanks for the review. I can’t speak to the bras as my size isn’t included, but I also purchased the Candace brief, and the Portia brief. On the advice of PP customer service, I ordered the Candace in UK22 to accommodate my 54″ hips, but went for the UK20 for the Portia bottoms. And I absolutely agree the sizing runs a bit large, as I suspect I could have sized down in both. The quality of fabric and construction is consistent with what I have come to expect from PP, and I love how different the Candace is to usual plus lingerie offerings. I still haven’t figured out the practicality of wearing the harness around my neck under clothing on a day-to-day basis, but shortening the strap to sit around the waist fixes that. I did also really love the look of the Emily gown and chemise, but am no fan of pink. I’d also be all over the Emerald in a brief style. I really hope the Curve collection has gone well and we get to see more interesting designs in plus sizes. Thank you so much Thursday! It has gone SO well (better than we ever imagined) and we’ll be running our next collection through to curve sizing.